NEW YORK and SINGAPORE, November 5, 2018 /3BL Media/ -- Circulate Capital, the investment management firm dedicated to incubating and financing companies and infrastructure that prevent ocean plastic, today announced that it expects to receive US$90 million in funding for its strategy to combat ocean plastic from several of the world's leading consumer packaged goods and chemical companies, including PepsiCo (NASDAQ: PEP), the first investor; Procter & Gamble (NYSE: PG), Dow (NYSE: DWDP), Danone (EPA: BN), Unilever (NYSE: UN) and The Coca-Cola Company (NYSE: KO). Circulate Capital anticipates formalizing definitive agreements with these parties by early 2019. Circulate Capital, its expected founding investors, and the Ocean Conservancy, a leading nonprofit environmental advocacy organization working to protect the world's ocean, held a joint event during the Our Ocean Conference in Bali, Indonesia on October 29, where they provided an overview of Circulate Capital's unique investment model, which is designed to create the lasting systems change needed to address the ocean plastic crisis. Circulate Capital's mission is to demonstrate the investibility of the waste management and recycling sectors to attract the billions of dollars of institutional investment capital that are needed to scale integrated recycling and waste management companies and infrastructure across South and Southeast Asia, regions identified as contributing disproportionately to ocean plastic pollution primarily because they lack the critical waste infrastructure to manage the problem. Circulate Capital's investment model seeks to mobilize institutional investment capital through financial structures that blend concessionary and philanthropic funds with market rate investment capital with a view to mitigating risk and demonstrating that investment in the resource recovery sector can ultimately provide attractive financial returns. "We seek to catalyze systems change by removing capital as a barrier to critical waste and recycling infrastructure development, and today's funding announcement is a huge step towards achieving this goal," said Rob Kaplan, Founder and CEO of Circulate Capital. "Institutional investors are unwilling to allocate to this sector because of a 'missing middle' -- proven entities that demonstrate a track record of profitability and offer a robust pipeline of investment prospects. By partnering with the world's leading corporations, many of which are direct competitors, we can leverage their patient capital and technical know-how to build on-ramps for institutional capital at scale over the longer-term." 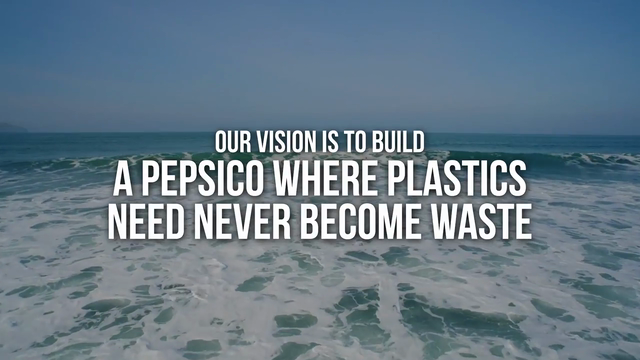 "PepsiCo wants to help create, reimagine and realign the entire ecosystem that generates and remediates ocean plastic pollution," said Dr. Mehmood Khan, PepsiCo Vice Chairman and Chief Scientific Officer. "We joined Circulate Capital as the very first investor because we share their inspired vision to develop a circular economy in which we can take old plastics and turn them into a new, reusable resource for future materials. It's what consumers want, it's the right thing to do for our planet and oceans, and it's good for business." "P&G remains committed to doing our part to help stop the flow of plastic to the ocean and we know it will take partnerships and collaboration to make meaningful progress. We're proud to join our fellow investors and the Circulate Capital team in working together to generate the innovation and investment needed to solve this critical global issue," said Procter & Gamble Vice President of Global Sustainability, Virginie Helias. "Circulate Capital's initiative is important because it empowers local people in the regions most impacted by waste to develop actionable and scalable solutions within their communities," said Diego Donoso, business president of Dow Packaging and Specialty Plastics. "There are many people with both the ideas and the resolve to tackle this waste challenge and Dow is proud to help provide the capital to make those ideas into solutions." "While we are working hard to ensure our packaging is designed to be circular, the reality is that it cannot be reused, recycled or composted without effective waste management systems in place," said Katharina Stenholm, Chief of Cycles and Procurement Officer of Danone. "Financing is often a barrier for proper waste management infrastructure implementation, especially in countries where formal systems are absent or in development. Investing in Circulate Capital would perfectly fit our roadmap and would support our vision towards a fully circular system where our packaging is safely reused, recycled or composted and never becomes waste or pollution." "We're proud to be taking a leading role in tackling packaging waste, but we can't do this alone. Moving away from a linear 'take-make-dispose' model of consumption to one that is circular by design will require new business models, investment in innovation and the development of infrastructure," said David Blanchard, Unilever's Chief R&D Officer. "This collaboration with Circulate Capital and other partners is an important step in unlocking the investment required to accelerate and scale up meaningful solutions to prevent plastic waste." "At Coca-Cola, we believe that every package has a value and a life beyond its first use, which is why we are fundamentally reshaping our approach to packaging with a bold, ambitious goal to collect and recycle a bottle or can for every one we sell by 2030," said Bea Perez, Coca-Cola SVP, Chief Communications, Public Affairs, Sustainability and Marketing Assets Officer. "Working with other partners and organizations, our global World Without Waste program aims to help create and implement effective collection and recycling infrastructures, so that empty bottles can have another life. Investing in Circulate Capital brings us all closer to the change needed to make plastic pollution a thing of the past. We believe it's the right thing to do for our planet and our communities." "Ocean Conservancy has been tracking marine debris for more than three decades through our annual International Coastal Cleanup, and we have seen firsthand how plastic has made its way to the top of the list of materials polluting our beaches and waterways," said Chever Voltmer, Plastics Initiative Director at Ocean Conservancy. "With an estimated eight million metric tons of plastic entering the ocean every year we need all hands on deck to solve this problem, including the private sector. That's why we were so eager to work with Circulate Capital and corporate partners last year to launch an investment firm that would invest in much-needed waste management solutions; and we are so proud to join them in making this funding announcement." Circulate Capital's strategy to prevent future ocean plastic reflects a uniquely comprehensive approach that goes beyond providing investment capital to entrepreneurs. Through The Incubator Network by Circulate Capital and SecondMuse, announced on September 20, 2018 at the G7 Oceans Partnership Summit in Halifax, Canada, Circulate Capital is also using philanthropic and public funds and technical assistance to support and develop public and nonprofit entities to implement new approaches and build capacity that can support large institutional capital commitments. Kaplan added: "Circulate Capital's innovative strategy addresses the critical gaps in capital needed – including investment, philanthropic and human capital – to create an ecosystem of innovation, investment, entrepreneurship and public-private partnerships to solve the problem. The model relies on partnering with local innovators who are implementing solutions on the ground in source communities, and on incentivizing a new generation of social entrepreneurs to build a fresh pipeline of potential projects." Circulate Capital is an investment management firm dedicated to incubating and financing companies and infrastructure that prevent ocean plastic. We focus on the prevention of mismanaged plastic waste in countries located in South Asia and Southeast Asia, regions that contribute disproportionately to ocean plastic pollution primarily because they often lack the critical waste infrastructure to manage the problem. We were created in collaboration with Closed Loop Partners and Ocean Conservancy, and our founding investors are expected to include PepsiCo, the first investor; Procter & Gamble, Dow, Danone, Unilever and The Coca-Cola Company. We are also supported by many other leading consumer product goods and chemical companies, intergovernmental organizations and associations including 3M, American Chemistry Council, Kimberly-Clark, Partnerships in Environmental Management for the Seas of East Asia(PEMSEA) and the World Plastics Council.